Adjustment Values and Ideal Value should be so I can get this baby running. What I am trying to find is my dial indicator reading I need to set my cam timing. I have set the pully at the Z1 mark and I have the dot on each cam pointing straight up. The dial indicator is mounted on the shoulder of the #1 intake valve spring retainer and is set at zero. The sprocket pin is in place and the chains slack has all been removed. When I rotate the motor clock wise for a short distance the dial indicator will begin to move. My question is " at what setting do I stop at??? Once I know this number I will stop. I will then remove the sprocket pin and move the pully back to the Z1 mark and replace the sprocket pin in the new hole that will except it. Left bank will then be timed and I will then move to the right bank. why T cams in a S engine? Thanks very much Daugaard….I did not have the money to buy S cams and I thought that that I might get a little more low end torque with the Ts. Originally I rebuilt a 2.4 S in 1985 with 2.8 pistons and cyl. Blew that motor up and did not have the time until now to rebuild. Sold the S cams for big bucks in 1987. All I had left was an extra set of T cams. Could not find anyone to trade cams with me. Thanks Jeff very much appreciated !!! Bob the number you have on the cams are for 74-75 2,7 150 hp. 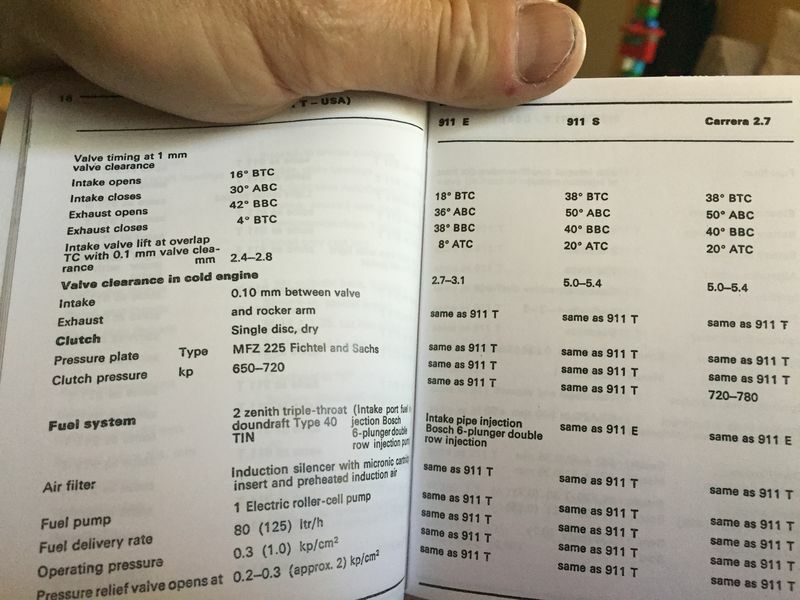 If you use the settings Jeff have your exhaust valve will touch the pistons. You have to find the exact timing for the numbers on the cams. Look for CIS cams settings. Those cams were also used on the 1973.5 T CIS engine. 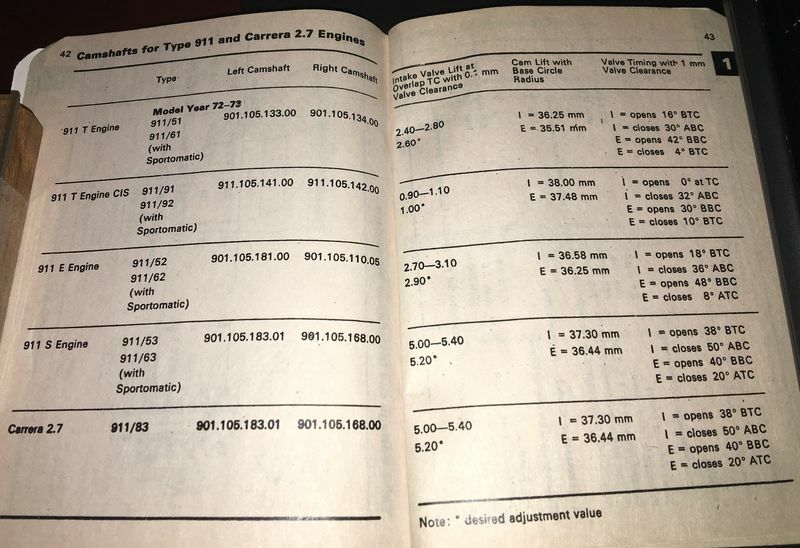 Here is a copy of the spec book settings for the 72-73 model years. Although I am not sure that the stock settings would be the best choice for this unusual combination. I have some real T cams from a '70 laying around. Let me know if that is some thing you could use. They could be reground to E specs. A nice cam for your motor.